First, I want to thank so many of you for sending me personal messages of prayers and encouragement this week. Some familiar and some "lurkers". I read and appreciate each note. I save a lot of them, and in times I need it, I reread them. They mean so much to me. 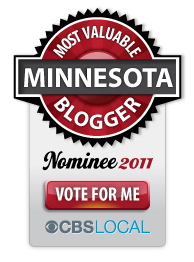 Secondly... my secret fan club (honestly didn't know I had one) must have been up to something recently, because one of my readers let me know earlier this week that I was nominated for Minnesota's most valuable blogger in the health/fitness/medical category! WOW! I'm not going to beg for your vote or anything, but if you read my blog and you like it , then please consider voting for me. You can actually vote once per day through September 9th! I am among some great bloggers including Jen from Prior Fat Girl, which is just about as thrilling! Anyways... I wanted to say thanks to whoever nominated me! I voted for you my Friend! You so deserve it!